Access POS offers a variety of POS terminal & monitor mounting options for "point of sale" (POS) applications ensuring a better interface with your customers or advertising and signage applications using larger screens. Access POS video display mounts allow for the clever use of LCD monitors and larger TVs for retailers. Our video display mounts and video display arms for the retail space ensure you don't have to compromise on the visibility of screen run promotions and our adjustable multi screen mounts maximise customer service. We offer a wide range of wall mounts, ceiling mounts, pole mounts and swing arm mounts. The "Max" Mount is the ultimate retail POS mounting option, as it can be configured to house a dual monitor / screen system, pos printer, barcode scanner & POS keyboard. All of the Access POS mounting options are of a tubular design allowing cabling to be neatly housed within the interior of the monitor mount. All Access POS mounting brackets adhere to the VESA mounting standard. VESA® stands for "Video Electronics Standards Association", an international non-profit corporation which represents more than 100 corporate members worldwide, and sets industry-wide interface standards for computing environments. 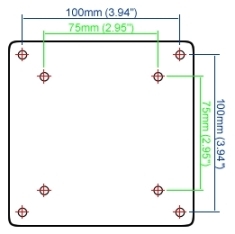 Monitor manufacturers worldwide agreed on the VESA standard, and most LCD monitors come with the VESA 75/100 standard mounting hole pattern, which means a square hole pattern on the back of the monitor: 75mm x 75mm or 100mm x 100mm (2.95in. x 2.95in. or 3.94in. x 3.94in.). The diameter of the screws are 4mm. The four holes may be centered or located on the lower edge of the monitor. On some models, the original foot or stand may need to be removed in order to expose the 4 holes. However, if the electronics are located in the stand, do not remove it - the LCD will not mount to any third party mounting option.